VuePress Tutorial For Beginners is the today’s leading topic. VuePress is composed of two parts: a minimalistic static site generator with a Vue-powered theming system, and a default theme optimized for writing technical documentation. Each page generated by VuePress has its own pre-rendered static HTML, providing excellent loading performance and is entirely SEO-friendly. Once a page is loaded, however, Vue takes over the static content and turns it into the full Single-Page Application (SPA). Additional pages are fetched on demand as the user navigates around the site. 3 Step 1: Install VuePress. 4 Step 2: Create a folder inside the root. 5 Step 3: Run the Project in development server. 8 Step 6: Create second md file inside docs folder. Built-in markdown extensions optimized for technical documentation. Ability to leverage Vue inside markdown files. Auto-generated GitHub link and page edit links. 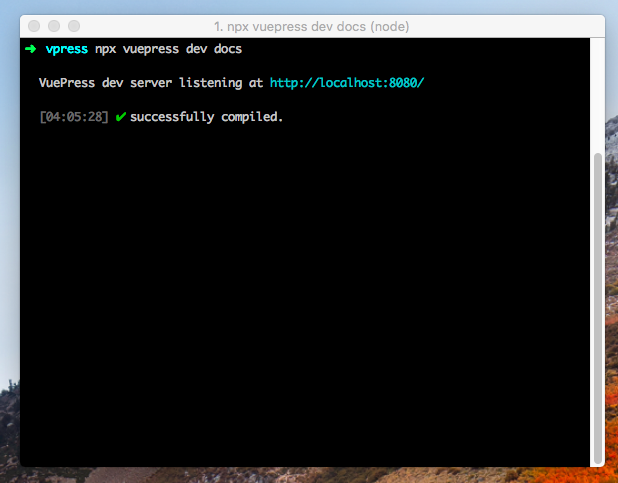 First, we will install the VuePress on our local machine. So let us do it. Create a project directory called vpress. I am using Yarn as a package manager, so let us pull the package using the following command. If you are not using Yarn, then you can pull through NPM. Now, open the project in your favorite editor. Step 2: Create a folder inside the root. Inside the project root folder, create one folder called docs. Now, in that folder, make one markdown file called a README.md. If you have previously written the Github Documentation then you familiar with Markdown Files. Also, you are familiar with README.md file. In the README.md file, just write the following line of code. Okay, now we need to run the project. Step 3: Run the Project in development server. Go into your root folder, and open the terminal and hit the following command. You can see the Hello World. Here # means h1 tag equivalent to HTML. It is simple Markdown syntax. You can add the scripts to package.json file. Now, stop the server by control + c and then start the server with the following command. You can also generate the static assets using the following command. By default, the built files will be in docs/.vuepress/dist, which can be configured via the dest field in docs/.vuepress/config.js The created files can be deployed to any static file server. For creating a configuration file, we need to first create a folder inside the docs folder called .vuepress. Okay, if your development server is running, then you can see that the page now has a header with the title and a search box. VuePress comes with built-in headers-based search – it automatically builds a simple search index from the title, h2, and h3 headers from all the pages. There are more configurations that you can apply, for example, base, title, head, Google Analytics, Port number and other stuff. In our project, docs folder is mainly reacting as a root folder, so we need to create one folder called images inside docs folder, and them move any local image to that folder. We can access using this syntax. You can see, now we can see the image in our page. You can check out the more options here. Step 6: Create second md file inside docs folder. Okay, now create second Markdown file inside docs folder called Demo.md. Write the following line inside that file and save it. Now, see the project in the browser. You can see here, the content is displaying in the browser and after clicking that link, we can redirect to a new route, and that is Demo.html. We have not defined any route but still, VuePress takes that second file as another route, and after clicking that link we redirect to that page. How cool is that!! It automatically figures it out by itself. You can check out the markdown extensions. It is handy for creating content. In future, we will build an entirely static website with the help of VuePress. It is the perfect framework for the creating technical documentation and blog. It is server-side rendered so entirely SEO friendly. VuePress Tutorial For Beginners is over.